Valentine Day is for Lovers, Roses and Chocolates. Although Valentine’s Day can be traced back to Saints in very early history, we will not explore that Valentine chapter here. What Valentine’s Day is now, is a day set aside for the showing of love and affections to one another. It’s a huge day for flowers, and candy gifts, especially Roses, and those Heart shaped boxes of Chocolates. Valentine cards are also huge; don’t forget! When you buy Roses for your wife or sweetheart, do you know what the different colors mean? Here's a refresher. 1. Red; Romantic Love, congratulations, respect, Courage, passion. 2. Dark Red; Unconscious Beauty. 4. White; Purity, Innocence, Reverence, Youthfulness, Secrecy. 5. Pink; Appreciation, Thank You, Perfect Happiness, Admiration. 6. Yellow; Joy, Gladness, Friendship, Delight, Jealously. 8. Red & White; Given together signify unity. 9. Peach; Appreciation, Sincerity, Gratitude. 12. Single Rose-Any Color; Simplicity, Gratitude. So for Valentine’s Day, you cannot go wrong with Red Roses. They are a popular gift, all women like Red Roses. When it comes to that Big Red Heart, filled with Chocolates, that is usually a better gift if there are little ones at home to help eat those calorie laden treats. If you are going to have the neighborhood kids over for a valentine party we have some fun games here that will help you keep them entertained. 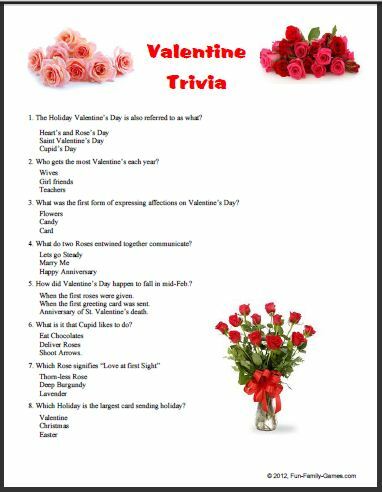 Or, visit our challenging, fun Valentine Trivia Game..